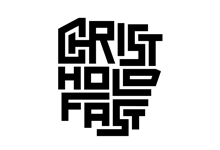 Christ Hold Fast is a Law & Gospel collective of creative contributors, dedicated to proclaiming to people how Christ remains faithful even when we are faithless (2 Timothy 2:13). They provide a voice for Christians who are both Sinner & Saint (Romans 7:15-25). They promote the bad news that you are a greater sinner than you think (Isaiah 64:6-7) and the good news that Christ is a greater savior than you can imagine (Romans 5:6-11). And get this… He will never let you go (Hebrews 13:5-6). Christ Hold Fast offers an annual national conference and regional CHF City Events.